Description: Long sloping bill. White head, back, neck, and breast. Black sides. Pale green nape and black cap. Female brown with evenly barred sides. 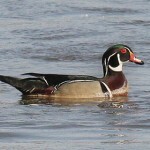 Female has same head profile. 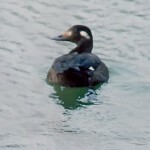 First winter male is brown with a white breast. 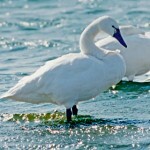 Habitat: Breeds near salt water. Winters in open waters of Hudson and James Bays. Where in Nebraska: Accidental in fall. 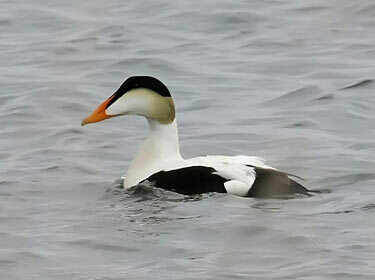 Field Notes: The Eider is a very tough and hardy bird and has been known to withstand temperatures down to – 50 degrees F.
Fun Facts: The latin name Somateria mollissima refers to the very soft down on the body. Eider down is used to make expensive pillows and usually comes from female Common Eider. Common Eiders were the subject of one of the first protection laws, established by St. Cuthbert in the year 676.